Technology is one of the benefits of living in today's world. It is non-negotiable for success in our educational, vocational, and social cultures. Yet, with all the advantages there are inherent dangers, deceptions, and abuses. Teens often look to their digital tools to make them happy, when you set boundaries or take them away they feel frustrated and incomplete. Unhealthy habits formed in this stage of life easily carry over into adulthood and addictions to technology make other additions more likely. 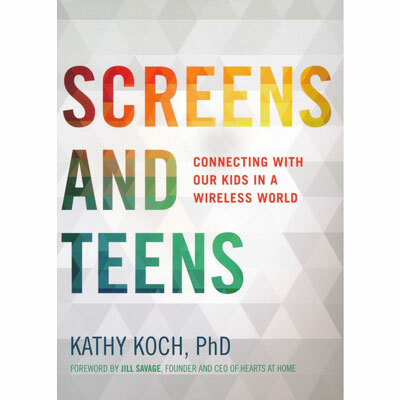 Screens and Teens applauds the good aspect of the digital age, but also alerts parents to how technology contributes to self-centered character, negative behaviors, and beliefs that inhibit spiritual growth, prescribing manageable solutions regardless of the level of thier teen's involvement. Unmasking the lies teenagers tend to believe, like "I must have choices," the book majors on truth, acknowledging that Truth alone brings contentment, freedom, and success. Kathy Koch, PhD Dr. Kathy Koch (cook), the Founder and President of Celebrate Kids, Inc., is an internationally celebrated speaker who has influenced thousands of parents, teachers, and children in about 25 countries through keynote messages, workshops, seminars, assemblies, and other events. Her practical, relevant, results-oriented concepts and engaging, honoring, and humorous speaking style draw enthusiastic reviews from children, teens, parents, and educators. They leave her events armed with new beliefs, attitudes, practical tools, and increased hope to make appropriate changes, establish healthy relationships, and increase success in family, life, and school.